(36-60” tall x 18” wide) Dynamite Gladiolus unites the strongest elements of cool and hot colors together in one flower and then gives you more of them – unfurling each blossom on a flowering spike from the bottom-up in mid-summer. Dynamite Gladiolus is a large 4-5 ft. cultivar, so it is eminently suitable for mid or back-of-border sites where the soil is rich and the sunshine is abundant. Sword shaped foliage will also add a vertical note against blowsier perennials and grasses. Give Dynamite gladioli protection from strong winds or lightly stake the flower spikes (inflorescences) to get the most out of the display–and don’t forget to cut a few for the house. Dynamite Gladioli is a dazzling vertical accent in an otherwise straight-laced bouquet. 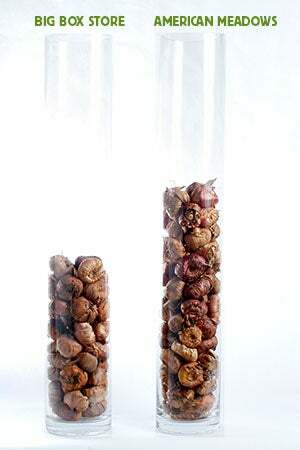 In cooler climates, corms can be lifted and stored in a cool, dark location over the winter months to provide just as many “explosive” blooms in next year’s garden.